I like that. Is it adjustable so you could change the angle of the grind depending on blade thickness and syle? yep, loosen the set screws and slide it back. I use this tool rest on almost every knife now. 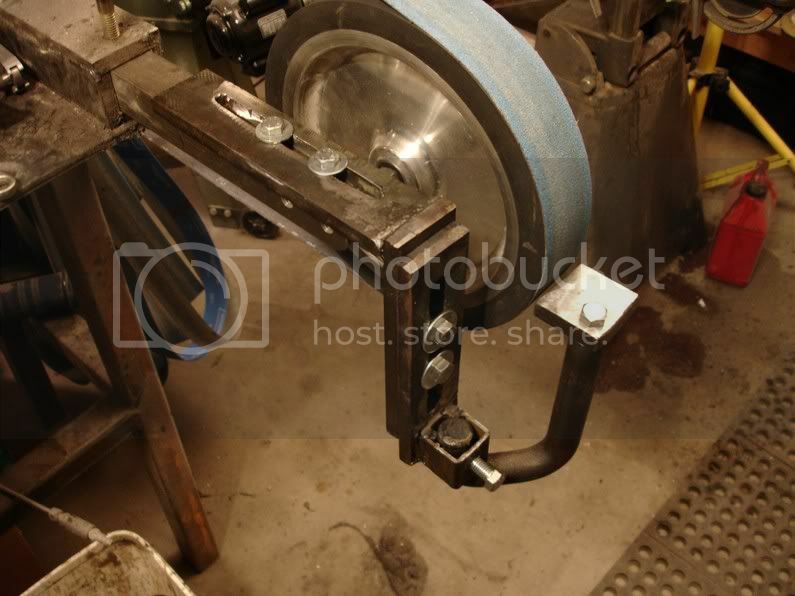 2" and 1 &1/2" square pipe welded with 1/16" strips button welded inside the 2" pipe for a snug fit. Very adjustable, very easy to assemble. There is a weld seam inside of the 2" pipe you will have to use a hand file to make smooth. I use a similar gizmo like this on my disk grinder. Great idea's bolth of you guys. I'm off to the shop to do some thinking now. I too need more angled pics! Very cool. Looks very versitile there Sweany. I love that blacksmithing page. I have spent many an hour there looking at all the cool stuff. "Many are chosen, but few are Pict"
There is a line, somewhere, that crosses from hand made knife to machine made. I don't really know where that is but using a tool rest to grind with isn't anywhere near it. Resting a blank on a tool rest is simply a way to steady the blank. You are doing all the rest. I was using a push stick for this but I quite using that since I lost the very subtle feel of the blade angle against the wheel. Now I use a pair of gloves and push the blade against the wheel with my thumb. This will work for flat grinding also. I'd say using this tool rest cuts down grinding time by at least half and reduces rejects from slips, sneezes and twitches by at least that much. ####, that's beautiful. I need to get me one of those. Baby was born on Christmas day. Mom is good so a reprieve is likely. Also, may bring the disk and grinder motor up too. Hey congratulations. A Christmas baby! Very nice. Glad mom is doing well. That kid needs a new tool rest, tell your wife you will be back by late supper and come and get it. Well , after trying to grind a 10" bowie blade freehand , I just couldnt hold it steady at the tip, I decided to build a work rest. Here is what I came up with , its fully adjustable and out of the way. Let me know what you think. Tracy made me one of his grinding jigs. I'd be totally lost without it. It's very accurate and precise. It may look a little rough, no matter, it functions flawlessly. I don't know if he's selling them or not right now, but if he is, I'd jump on one. Being fairly new to knifemaking but not to fabrication and shop work I have an observation and a couple of questions for you more experienced grinders. In Sweany's lead off post the picture of his grinding jig is described as having a "weld(ed) on pulley" on a 7/8" shaft. The shaft appears to be adjustable fore and aft and locked in place by the coller and set screws. To me this makes good sense as it would capture the back of the blade and present a constant angle to the belt as you move the blade across. Further, it allows for a fixed, tangential pivot point as you approach the point of the knife giving a shorter lever moment as the knife is rotated past the blade curvature. In subsequent posts we see pictures of inovative workrests that have a smaller "table" than comes with, for example, my KMG but they have a short horizontal surface and no way to maintain a constant angle except through experience, manual support and skill. With a table it is necessary to raise the tip of the blade as you approach the point in order to maintain some constancy and control with the grind line. What do you all see as the pros and cons of each type? I know, as usual, it is a YMMV kind of thing but Sweany's solution intrigues me as it seems to have some advantages for maintaining consistency. What limitations would you anticipate with this style. Sweany, if you are still following this post I, for one, would be grateful if you could give us some feedback on how it is working out for you. Whooooa , Thanks Tracy . That means alot to me. I think I love to build tools as much as I love to build knives. Allen : I learned to hollow grind freehand , no teachers , no rests, no videos, no BS. I got some scrap and started grinding. Dont get me wrong , I'm no pro like some of the other guys on this post. I tried this rest I built tonight , I'm mixed on it. Not sure if a I can like it or not. Unless your blade has the same depth from ricasso to point , your going to have to change the height of the rest as you go , ie.. tilt the blade downwards( the tip up) as you get closer to the tip when grinding. I did play with some vice-grips as a stop to hold the blade vertical( to keep the same angle on the grind) just not sure yet. The whole reason I built this rest was that I was trying to grind a 10" Bowie , its hard to hold it steady that far away , and as the cutting edge gets closer to the tip it also gets closer to the center axis of the blade. The spine does the same thing , not quite like a dagger , but close. From what I could see of Sweany's rest , I would still have the same problem as mine. I like the way his is round , I may make a round one also. After looking at it again , Ilooks like it would work great for flat grinding. It all boils down to one thing to do it right PRACTICE , PRACTICE , PRACTICE. And I am still practicing.